Wachau Cultural Landscape comprises a Danube valley with a long historical evolution. There has been human occupation in the Wachau from Palaeolithic times. The valley is well-known for its production of apricots and grapes, both of which are used to produce specialty liquors and wines. It also has impressive buildings and picturesque historic towns. 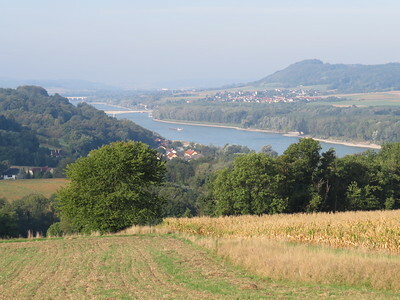 The Wachau is located along the Danube between Melk and Krems, together with the slopes and the adjoining Dunkelsteiner Wald and the southern Waldviertel. The abbeys of Melk, Dürnstein and Göttweig are among the finest Baroque buildings in Austria. The Wachau is a riverine landscape in Northeast Austria. Here the Danube flows for 36km through a fertile valley, that has been used since the Middle Ages for growing apricots and grapes - yes, this is another viticulture WHS. Fortunately they have thrown in a number of palaces, castles and picturesque historic town centres to enhance the visitor experience. A wealth of individual monuments and places has been highlighted in the nomination file. I visited on a Sunday, and thought it would be a nice idea to start the day with a hike enjoying the river views. I parked my rental car in Schönbühel, a small town east of Melk. An oversized palace dominates its town center. It provided a tantalizing start, though you cannot get in because it's in private use. Just as in Neusiedl, which I visited the day before, cycling is very popular here: one can traverse the entire Danube valley on a smooth bike path. Unfortunately there is no separate trail for hikers, and there’s a lot of noise from car traffic on the parallel road. Hiking by far turned out less pleasant than I had imagined. When I also could not find the follow-up signs for my planned 2 hour ‘Steinwandweg’ walk, I decided just to push straight on for 5 km to the city of Melk. I had planned to visit it later in the day, now I arrived already at 10. Melk is a major crossroads in the Wachau: it holds one of the few bridges across the Danube in this area, and also is connected via an intricate road network to the highway to Vienna. Its historic center does have a few notable buildings, but the overall atmosphere was a bit too old fashioned for me. Only the murals on the exterior of the 16th century former clergy house could hold my attention for a while. 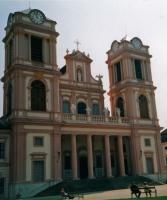 Melk is famous for its great Abbey. Each year, it is visited by more than half a million tourists. On this early Sunday morning the courtyard was already filled with groups of visitors. The Americans and Asians evidently know how to find it on their beaten path through Europe. I joined a German-language tour through the Abbey for 12 EUR (you can also visit on your own, then it costs 2 EUR less). The Abbey is still used by Benedictine monks, and has an active highschool with 900 pupils. It is a huge complex, the wealth from the past is visible all around. The interior is not as interesting as the exterior would suggest, with the sole exception of an ingenious spiral staircase. After a filling & cheap lunch at a Mexican/Greek/Italian restaurant I was ready for the walk back to Schönbühel. There's a 2 hour route signposted from the Abbey, so I tried that one. I can be brief about the outcome: this alternative route was even more boring than the one in the morning. The outskirts of this town really aren't pretty. There’s much more to see in this region than can be covered in one day. I was intrigued by the Gozzoburg in Krems for example, which can only be visited once a day during the summer months. I believe that you’d need to find a quiet time in the year to really enjoy the Wachau – although due to its proximity to Vienna, I am afraid the tourism business here seldom is slow. With this trip, I have for now ‘completed’ Austria (a total of 9 WHS). Looking back at these visits, the common factor among them is that I found all Austrian WHS over-touristy. Tourism has a long history in this country and its main sites are very accessible. WHS hunting here rarely leads you to undiscovered destinations or surprising discoveries. I visited this WHS in August 2015. I spent 2 days in the Wachau valley. Unlike many tourists, I decided not to visit this great Austrian WHS as a day trip (train-abbey-cruise-train) from Vienna but to base myself in the quaint village of Melk. It turned out to be a wise option as early morning and late afternoon were quieter and cooler to visit too in the Summer. During the first day I visited the massive Melk abbey. While driving to Melk, the abbey is almost hidden in the Wachau valley but once I approached the corn fields just a few kilometers away, I could admire the sheer size of this recently restored abbey. The best light for photography of the Melk Abbey Church is sunset although the morning light is perfect to take pictures from the abbey terrace or inside the abbey courtyards. 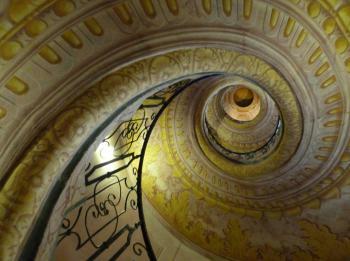 The highlight of my visit was definitely the spiral painted staircases. Most tourists stop to take pictures of the first staircase they descend to reach the church, however I recommend heading directly opposite this staircase towards the exit as there is an identical one that leads to the library (closed to the public) which is perfect to take pictures of without having to "photo-chop" a couple of curious tourist heads. The library is worth viewing too although it doesn't compare to the one in St. Gallen or others I visited. Another abbey worth visiting is the Gottweig Benedictine Abbey, which is part of the Austrian Route to Santiago de Compostela. The best views of the Wachau valley are to be had from the ring road or from one of the castle ruins that dot the surrounding hills above the vineyards. On the second day I took a Danube cruise (24 euros) from Melk to Krems (downstream) and I stopped in Krems and in Durnstein. The bus ride back to Melk (7 euros) is very expensive and is only available once every hour. All in all the Wachau valley is an interesting WHS even though very touristy and definitely one of Austria's best WHS. I took Klaus' advice and took a cruise along the Danube between Melk and Krems. The majestic architecture of Melk Abbey and Durnstein were awe insiring. But the relaxed atmosphere of watching the Wachau landscape drift past was special. It was one village after another, interspersed with castles and vinyards. To avoid the exorbitant hotel prices in Vienna I stayed at a delightful gasthof in the village beneath Melk Abbey. A trip to the Wachau valley really is an impressive day trip from Vienna. I started off my trip with a guided tour of the abbey at Melk. It really was striking, sitting on a bluff looming over the small town below. In winter the only way to see the interior of the abbey is to go on a guided tour. I normally dread these in such grand places; however this one was pretty inspiring. We were shown around by a resident nun how did a great job of contextualising everything we saw. I was happy that the museum was laid out to show the evolution of the abbey and the art with in it, rather than just highlighting some dusty ornate furnishings. The highlight is undoubtedly the magnificent baroque library. Another site well worth seeing is the chapel which is an over-the-top baroque masterpiece. You can visit the chapel without going on the tour, but you are restricted to a small side section, however you can see the whole interior from there. After a quick coffee I headed off on a small post-bus that drove me the whole length of the valley to Krems. This gave me good view of many of the major sites of the valley, without having to brave the freezing conditions. In Krems I had a lovely walk through the cobbled streets hunting out some of the wine that is produced on the river banks that I had just driven through. After a meal and a further stroll I was back on the train to Vienna having enjoyed a wonderful afternoon trip. The valley is easily visitable as a day trip from the capital; however in warmer months it is the sort of place that would reward a longer more genteel meander. On a day trip from Vienna I went to both Krems, Weißenkirchen and Dürnstein. Both proved to be quite a pleasant surprise. Krems is the central town of the Wachau and has a nice historic town with a monastery to be visited. Some modern museums are nearby, notably a very good caricature museum. From Krems you can take the Wachau Train which goes along the left Danube bank through the Wachau villages. Weißenkirchen is the first stop. It is the village displaying the oldest architecture. It is very picturesque with its enormous medieval fortified church in the middle of the village. Dürnstein (the next stop of the train) is probably the prettiest of the three and is overloaded with tourists on weekends. It is beautifully located along one of the Danube's curves, amongst vineyards and near the ruins of Dürnstein Castle. Its most spectacular views are from the local Jesuit monastery that can and should be visited exactly for this reason. 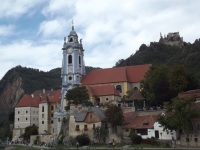 The Wachau is very compact and easily accessibly with public transport from Vienna. Note that there are no bridges so if you want to visit famous Stift Melk you have to take a different train from Vienna or go all the way to Sankt Pölkten. Famous local products are wines and apricot jam. The Wachau Valley is really a magical place. It has almost mediterranean character somehow unexpected in the middle of a bit boring fields and forests typical for central Europe. 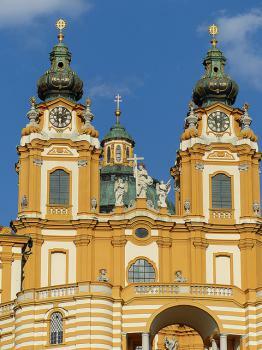 Valley itself decorated with such monumental buildings like Melk monastery is incredible. However, I enjoyed very much antient parts of Krems and Stein, especially several churches and palaces dated back to 13th century. The Wachau Valley is incredible. I was fortunate enough to spend a couple days in Waldkirchen on a VBT Bicycling vacation this past June. We stayed in the Raffelsberger Hof bed and breakfast, feasting on Marillen preserves, and spent three days pedaling up and down the Danube. Highlights included the Benedictine Abbey in Melk, hiking up to Dürnstein for a sunset picnic and biking through the farmer's market in Ottensheim, only to find Raku pottery, a wealth of recycled jewelry and incredible woolens from around the valley. VBT treated us to a fine sampling of Grüner Veltliners and Reisling wines in a refinished wine cellar in Waldkirchen, and after a long day of riding, that sweet, aromatic white wine simply hit the spot. If you are interested in exploring the Wachau Valley, I encourage you to take a bike tour. Free from a tour bus, I was able to explore the countryside at my own pace, inhale the sweet aroma of apricots along the flood plains of the Danube, and enjoy white wine sabayon and Marillenkuchen (apricot cake) at the end of the day, without feeling guilty. In the Wachau valley we have been only at the Göttweig abbey, founded in 1074 by the Augustinians on a hill on the right Danube bank. Across the entrance portal, near which is an the Porter's Lodge, remain of an ancient medieval castle, you pass to the main court, where is the Baroque church, with two towers and a porch projected by C. Biasino and J. L. von Hildebrandt. Inside is the Baroque nave and the Gothic apse, with chapels, tombs, an organ, a pulpit by H. Schmidt, altars, stuccos, a treasury paintings by Kremser Schmidt and A. Wolf and a Gothic crypt. In the abbey palace there is the imperial staircase, with frescos on the ceiling by Paul Troger, and many buildings and rooms: the imperial apartments, the Hall of St. Cecilia, the "Grand Hotel", the library, the choirboys' seminary, the gatehouse and the Chapel of St. Erentrudis. I liked very much this abbey because of the quality of its architecture. It's worth to be visited if you are in the Low Austria and I think that Wachau justifies the inscription, even if I have seen only this abbey. The Wachau Valley stretches for over 30 km along the Danube River between the towns of Melk and Krems in Lower Austria, west of Vienna. It is certainly one of the nicest areas in Austria, and if you´re lucky enough and the weather is fair, it makes for an unforgettable trip - preferably by boat, although there are nice bike trails as well. The valley´s steep banks are covered by vineyards, and there are many small villages with churches and castles. The abbey of Göttweig, the ruins of the castle at Dürnstein, where Richard the Lion-Hearted was held captive and Blondel came to his rescue, and above all the fantastic Benedictine abbey of Melk, featured in The Name of the Rose, are also in this WHS. It is probably one of the best daytrips you can make from Vienna (but not in winter): go by train to Melk, see the abbey, go by ship to Krems, go to a wine restaurant (a Heuriger) there, and then go back to Vienna. Libraries: Stift Melk's Monastic Library & Göttweig Abbey: The abbey has a library of 130,000 books and manuscripts, and a particularly important collection of religious engravings, besides valuable collections of coins, antiquities, musical manuscripts and natural history, all of which survived the dangers of World War II and its immediate aftermath almost without loss. Hospitals: Kloster Und in Krems served as a hospital.